Emergency vehicle plates, 1920s to present — law enforcement, fire and rescue, etc. 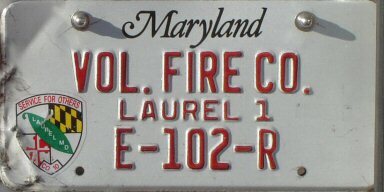 This page covers this history of Maryland license plates used on emergency vehicles such as police cars, fire trucks, and ambulances. October 3, 2018 – Added a 1968 commerical ambulance plate. Replaced photo of someone else's 1983-84 State Police motorcycle plate with that of one I've added to my collection. Minor text updates. 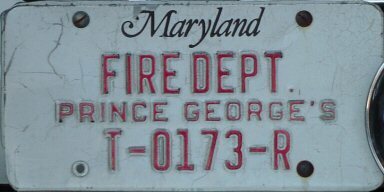 June 15, 2017 – Added a photo of a pre-1956 Violetville Fire Department plate. Maryland government vehicle license plates can be a real challenge to positively identify or accurately date. 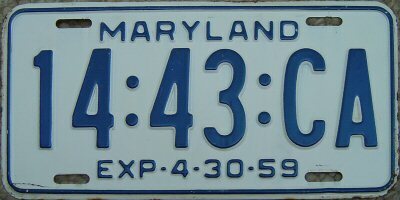 Many of these plates looked nothing like regular Maryland plates, and/or were undated and used for many years or even decades, even while the regular, non-government plates were being replaced annually. On the other hand, during the past couple of decades, some agency-specific government plates have been reissued with new designs, sometimes repeatedly, while the regular plates and generic government plates soldier on, unchanged. I observed Maryland license plates first-hand on a daily basis from the early 1960s to early 1990s, so I can often shed light on this confusion. However, in some cases, what I've written is based on educated guesswork, or very limited observation, or maybe even faulty memory, and so it's just about certain that I've gotten something wrong somewhere. So, if you spot what you think is an error, or have additional or clarifying information, or can send a photo that you've taken of a plate not already shown, please send me an e-mail and help make this page more accurate and complete. There's a link to my e-mail address at the bottom of every page. Please note that all plates shown that are credited to another person, or are in actual use, are plates that I am still seeking for my own collection. 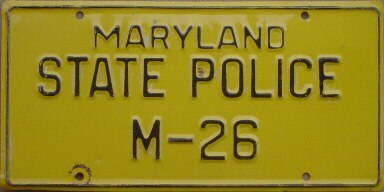 The Maryland State Police (MSP) was established in 1935. It took over the role of the Commissioner of Motor Vehicles State Police Force in patrolling the highways of Maryland, and had additional law enforcement duties assigned to it as well. 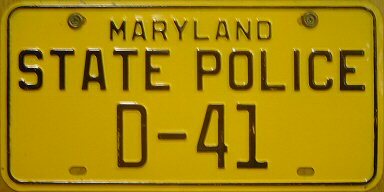 It's a challenge to positively identify the age of most Maryland State Police license plates. With the exception of the 1985 50th Anniversary plates, they've always been undated and used for multiple years. 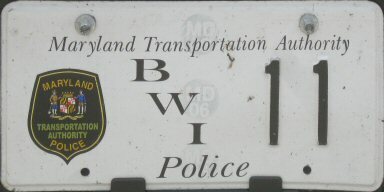 Plates manufactured between 1935 and 1956: Circa 1930s-40s State Police motorcycle plate and 15 inch car plate (Harbold plates). 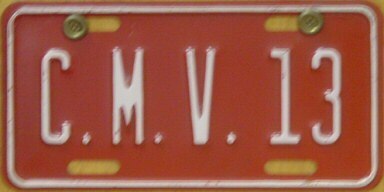 Circa 1950s 13 inch car plate (Olivarri plate). 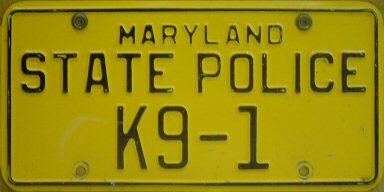 In the early days, the Maryland State Police consisted primarily of motorcycle officers, and so most MSP license plates were smaller motorcycle plates. The ones I've seen photos of are different in size and bolt hole location and shape from regular Maryland motorcycle plates. 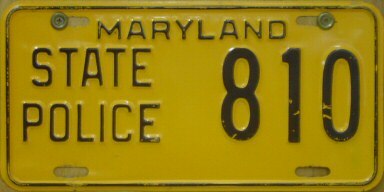 Early MSP cycle plates were black on yellow, and had the words Maryland State Police, one word above the other, occupying the left and center portions of the plate, with a numeric plate number on the right side. I believe that these motorcycle plates were 10 inches long by 4 1/2 inches high; some have bottom bolt holes and others do not. According to one report, motorcycles were retired from MSP duty approximately in the late 1940s. 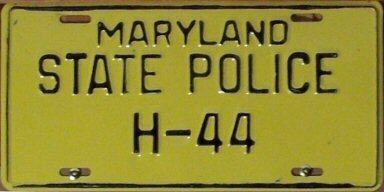 Older Maryland State Police car plates I've seen nearly always are 15 inches long, which would seem to imply that they were manufactured in 1935 and/or 1936. 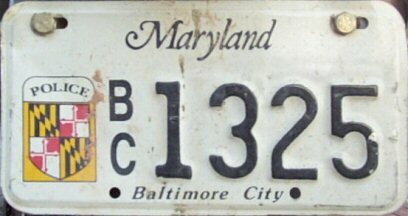 Regular Maryland car license plates were 15 inches long through 1936, and 13 inches long from 1937 through 1956 expirations. Because of their quantity, I'm speculating that MSP car plates (and other state government agency plates) continued to be made well after 1936 on the leftover 15-inch by 6-inch 1936 plate blanks, perhaps being both made and used well into the 1950s, despite their size. The 13 inch MSP plates are most likely from the latter part of the 1937-1956 period. 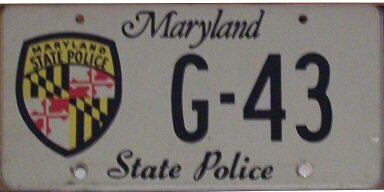 All of these plates were black on yellow, and had the words Maryland State Police stacked vertically on the left, with a serial number on the right. As with the 15 inch State Roads Commission plates, 15 inch MSP plates were made both with and without small corner bolt holes. Plates manufactured between about 1956 and 1963: Circa late 1950s plates, from Headquarters – Pikesville (Harbold plate), an unknown usage plate with a high number (Harbold plate), and Barrack C – Cumberland (Ceravola photo / plate) Circa early 1960s Barrack C – Cumberland (Sells photo / plate), Barrack H – LaPlata ("Whitey" photo / plate), and an unknown "TR" type. 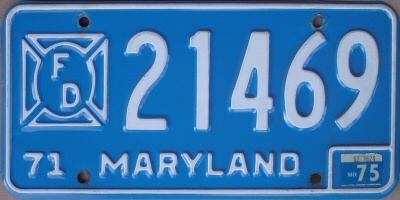 Plate manufactured between about 1964 and 1969: from Barrack D – Bel Air (Harbold plate). 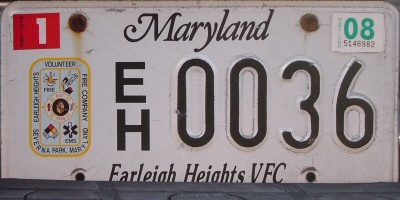 Plates manufactured between about 1970 and 1984: Circa early 1970s plates, from Barrack M – JFK Memorial Highway and the Canine Unit (plate owner not identified) (compare the dies to the early 1960s plates above). Circa late 1970s/early 1980s plates, from Headquarters – Pikesville ("Whitey" photo / plate), an unknown usage plate with a high number ("Whitey" photo / plate), from Barrack A – Waterloo (O'Connor photo / plate), from the Aviation Command ("Whitey" photo / plate), from the defunct Barrack K – Security commmander's car ("Whitey" photo / plate), from the Canine Unit (Harbold plate), and from the Tactical Unit (Ceravola photo / plate). Circa 1983-1984 State Police motorcycle. As license plate dimensions became standardized at 6 inches by 12 inches across North America during the mid-1950s, car manufacturers began making vehicles that could not accommodate larger license plates. Therefore, it became necessary to retire the old 15 inch plates. 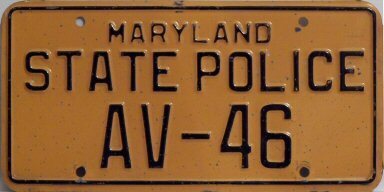 Between about the mid-1950s and 1984, Maryland State Police car plates were 12 inches long and were painted black on yellow, with the words Maryland State Police embossed on the plate. There were minor design variations during this period that are a challenge to pinpoint time-wise. 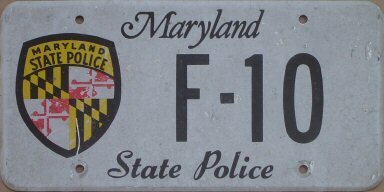 Perhaps the best method of identifying approximate manufacture dates is to compare state police plate design changes to corresponding design changes on regular, dated Maryland license plates. 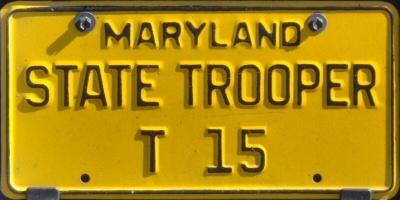 Long bolt slots – Regular Maryland plates with expiration dates between 1957 and 1964 had long bolt slots, so it's likely that state police plates with long bolt slots were manufactured between 1956 and 1963. However, these plates could have been used through 1984. 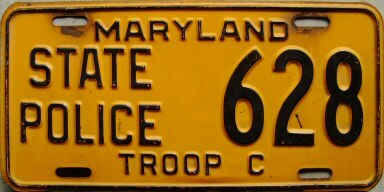 Short bolt slots – Regular Maryland plates with expiration dates between 1965 and 1970 had short bolt slots, so it's likely that state police plates with short bolt slots were manufactured between 1964 and 1969. However, these plates could have been used through 1984. 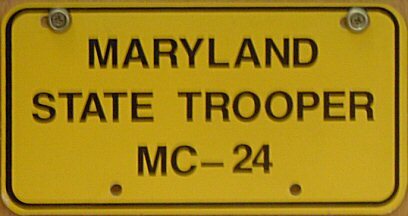 Round bolt holes – Regular Maryland plates with expiration dates beginning in 1971 had round bolt holes, so it's likely that state police plates with round bolt holes were manufactured and used between 1970 and 1984. 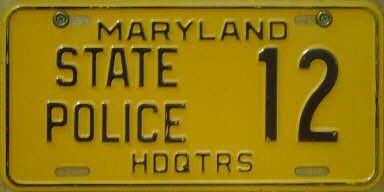 According to one source, the Maryland State Police resumed motorcycle patrols approximately 1983 or 1984, after a 35 year absence. Perhaps in anticipation of the upcoming 1985 50th Anniversary MSP plates, the state didn't go to much trouble to make up special MSP motorcycle plates. The plates were made on the standard motorcycle base, even including a sticker box (which of course was not used), but were painted black on yellow rather than the normal black on white. Low serial numbers were issued, probably starting at 1. There was nothing on the plate to identify it as a police plate. 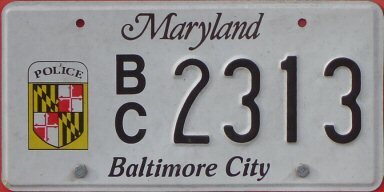 Circa 1985 plates from Barrack A – Waterloo (Doernberg plate), from the defunct Baltimore-Washington International Airport unit (Harbold plate), and from the defunct Barrack K – Security commmander's car ("Whitey" photo / plate). 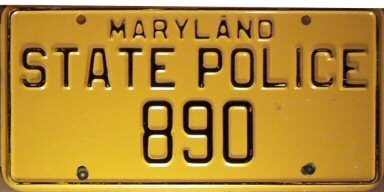 For 1985, to commemorate the 50th anniversary of the Maryland State Police, vehicles were replated with graphic plates made on a reflective white background. 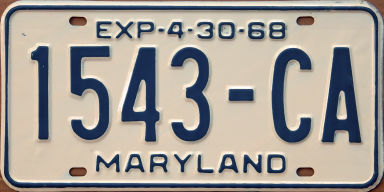 These plates were very closely patterned after the 1984 350th Anniversary optional issue plates issued to the general public. The dates 1935 and 1985 were screened in the upper corners, and the legend 50th Anniversary was screend along the bottom edge. On the left side of the plate was a large MSP emblem. Serial numbers were also screened. It's reported that these plates were actually used for several years beyond 1985 until individual cars were removed from service. I don't think I've seen a motorcycle version of this plate. Circa 1986-1996 plates from Headquarters – Pikesville (Harbold plate), an unknown usage plate with a high number (Olivarri plate), the defunct Baltimore-Washington International Airport unit (Ceravola photo / plate), the Commercial Vehicle Enforcement Division (O'Connor photo / plate), Barrack F – North East, Barrack G – Westminster ("Whitey" photo / plate), the Canine Unit (plate owner not identified), Barrack L – Forestville ("Whitey" photo / plate), likely Motor Carrier Safety Assistance Program (MCSAP) error plate (Olivarri plate), a marked State Police vehicle dedicated for use by the State Highway Administration at road construction sites ("Whitey" photo / plate), and a State Police motorcycle (Harbold plate). 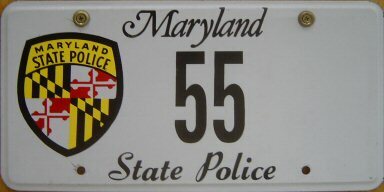 From the late 1980s until the late 1990s, State Police plates were similar to the previous 1985 50th Anniversary plates, but were undated, and had the words State Police at the bottom, rather than 50th Anniversary. Again, the plates were black on a white reflective background, had the MSP logo on the left side, and were completely screened. 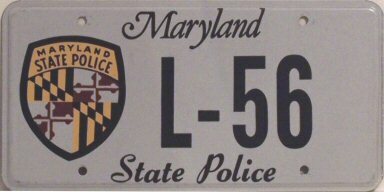 On the motorcycle version of this plate, some had the State Police legend and the bottom, and others did not. I'm pretty sure that the "MSCAP" plate shown above is an error plate. When I did a Google search on MSCAP to find out what it stood for, all I could find were obvious misspellings of the acronym MCSAP, which stands for "Motor Carrier Safety Assistance Program". MCSAP seems to be some sort of program that provided federal funding to various state police and highway patrol agencies related to enforcing commercial truck and bus safety regulations. 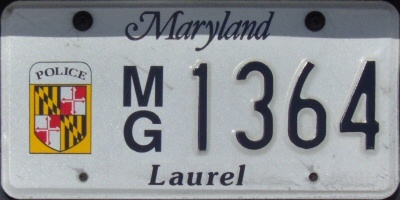 Current plates from Barrack H – La Plata, and Barrack T – Leonardtown (both plates photographed in actual use). 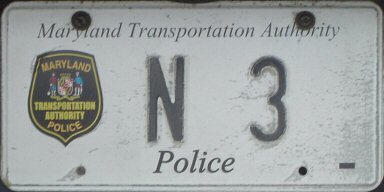 Current State Police trailer plate (Ellis photo of plate in actual use) and State Police motorcycle plate (plate owner kept confidential). 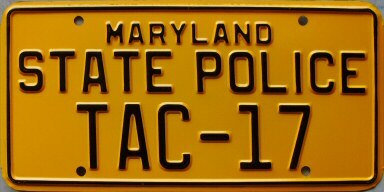 Beginning about 1997, Maryland State Police plates have gone retro, and at first glance appear to be very similar to the 1970-1984 plates. Like the plates of old, the current ones are all-embossed, non-graphic, and sport black characters on a yellow background. But there are a few distinct differences. 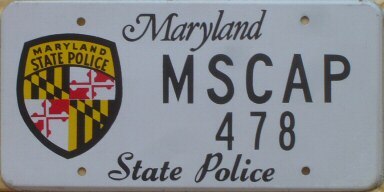 First, the new plates read Maryland State Trooper rather than the earlier Maryland State Police. 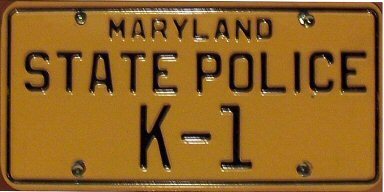 (In case you were wondering, the agency name is still Maryland State Police, but the individual officers have always been referred to as "state troopers".) 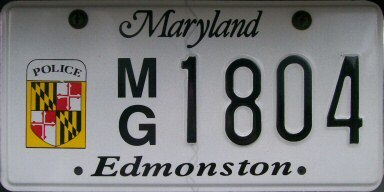 Second, the new plates are reflective rather than painted, and they have a hologram running down the center of the plate indicating the date of manufacture. Current motorcycle plates look similar to the full-sized plates, but they're fully screened rather than embossed. 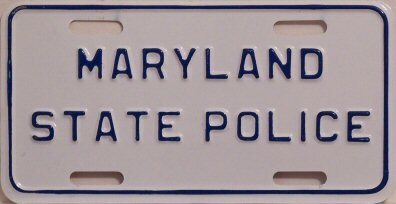 Maryland State Police dashboard plate made from a motorcycle license plate blank, circa 1960s; additional Maryland State Police dashboard plates of uncertain vintage ("Whitey" photos / plates). 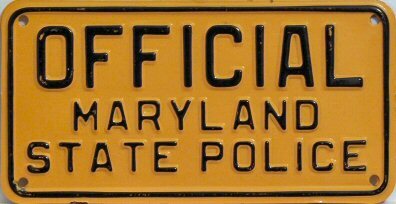 Maryland State Police dashboard placards apparently are used to identify unmarked vehicles on official state business. I'm guessing that these authorize said vehicles to park in no-parking zones. In at least some instances, these placards were made from motorcycle license plate blanks. Maryland's motor vehicle agency was known as the Office of the Commissioner of Motor Vehicles from 1910 to 1943, the Department of Motor Vehicles from 1943 to 1971, and the Motor Vehicle Administration (part of the Department of Transportation) from 1971 to present. 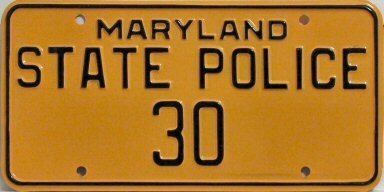 Prior to the establishment of the Maryland State Police as a separate entity, the Commissioner of Motor Vehicles had under his authority a unit known as the State Police Force. 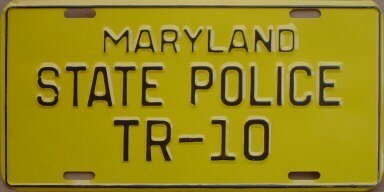 The State Police Force consisted of motorcycle officers who patrolled the state's highways from 1921 until it was replaced by the Maryland State Police in 1935. The undated plates used on these motorcycles were colored white on red, and the body of the plate consisted of the letters "C.M.V." followed by a distinguishing number. 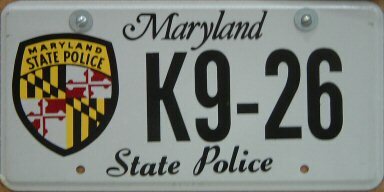 Some know examples have no other identification, while others have embossed at the top and bottom of the plate "Maryland" and "State Police", respectively. The State Police Force also had some cars that used full-sized plates, but these were much less common. I know of at least two different undated Maryland plates with the stacked words "Dept. Motor Vehicles" on the left side. Both have the state name along the top edge and "Drive Safely" along the bottom edge. Serial numbers of up to three digits are on the right body of the plate. One such plate is colored silver on black, while the other is black on yellow. Both have long bolt slots top and bottom. The black plate also has small bolt holes in each corner. If I were to guess, I'd say that the black plate was made in the 1943-1947 period, and the yellow plate appears to have been made between 1956 and 1963. It's unknown how long either of these plates were used, or what purpose DMV vehicles might have served. 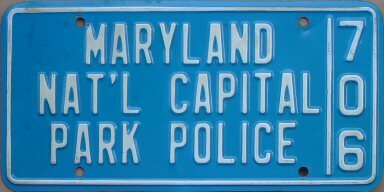 The Maryland Toll Facilities Police was formed in 1971 with the merger of the State Roads Commission Bridge Guards unit and the Harbor Tunnel Special Police Force. 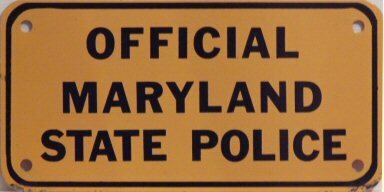 Like its name implies, the Toll Facilities Police was responsible for law enforcement at Maryland's various toll bridges and tunnels. Its vehicles bore white on blue license plates that looked like Maryland local government police plates, but it was in fact a state agency. 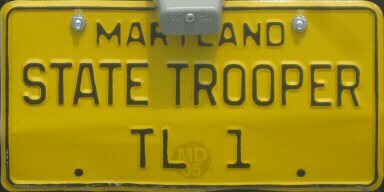 In 1994, the Maryland Toll Facilities Police was renamed the Maryland Transportation Authority Police, and over the next few years its responsibilities were expanded to assume law enforcement at the state-owned Baltimore-Washington International Airport from the Maryland State Police, and at other transportation-related locations such as marine terminals in the Port of Baltimore. Again, Transportation Authority Police plates looked like local government police plates, this time with a generic police logo on the left side of an otherwise standard-looking black on white Maryland license plate. 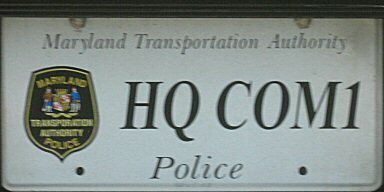 The two-letter stacked prefix used to distinguish this agency was "T/A". 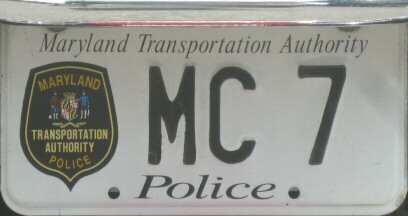 Sometime in the late 1990s or early 2000s, someone decided that the Maryland Transportation Authority Police should have license plates that didn't look like city or county cop car plates, and the stacked "T/A" plates were replaced with new plates of a unique design. 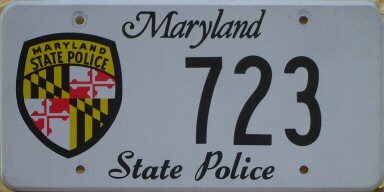 These new plates are also black characters on reflective white plates, but with the words "Maryland Transportation Authority" across the top in place of the usual state name, and "Police" along the bottom, with the agency's sheild on the left side of the plate. A variety of letter codes are used on these plates, as shown above, but I don't pretend to know what they all mean. 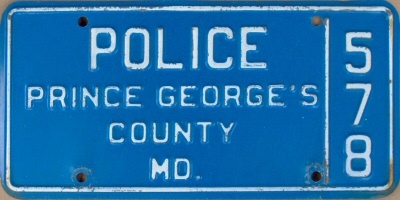 In years past, this state agency used white on blue police plates in the same style as the Maryland Toll Facilities and local police department plates. This agency currently uses very unusual yellow on black plates with a yellow border. 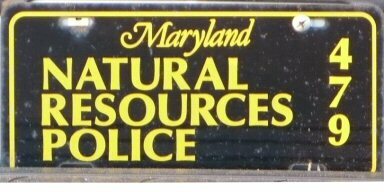 The state name appears in yellow at the top of the plate in the familiar script font, and the words "Natural Resources Police" are stacked one above another taking up most of the body of the plate. 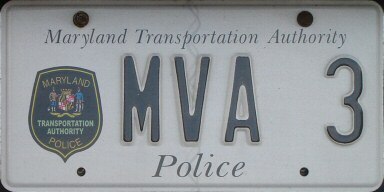 The vehicle unit number is stacked vertically on the far right side of the plate. It's quite unlikely that this agency has anywhere near 479 vehicles in its fleet. One plate spotter reports having seen a Natural Resources Plate in use that was of the same design as the plate shown above, but with red lettering on a black background, with the number 949 stacked at right. I have no information about this plate or the distinction between the yellow-on-black vs. red-on-black Natural Resources Police plates. 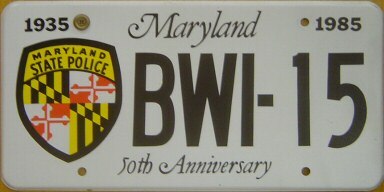 This organization uses standard current Maryland plate blanks, with the legend "State Fire Marshall" at the bottom and the agency's logo at the left of the plate. The serial characters are screened, however. 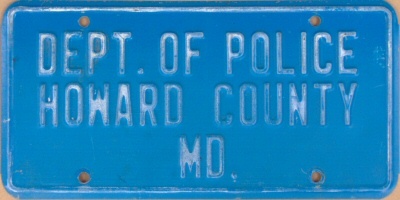 Maryland city and county police and sheriff's plates manufactured 1955 or earlier were similar to the white on blue plates made and used from 1956 to about 1990. However, the plate dimensions differed from the current 12 inch by 6 inch size used since 1956. 15 inch long plates could date from the 1910s to at least 1936 and likely into the 1950s, and 13 inch long plates could have been made between 1937 to 1955, but probably only in the last few years of that period. 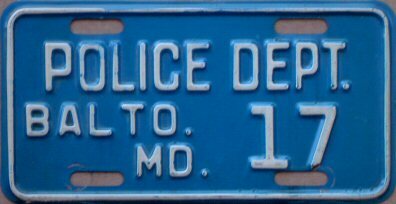 Based on their sheer quantity as well as bolt hole characteristics, I believe that Maryland continued to manufacture government and emergency vehicle plates on 15 inch long blanks long after 1936, which was the last year that regular, "civilian" plates were made that size. 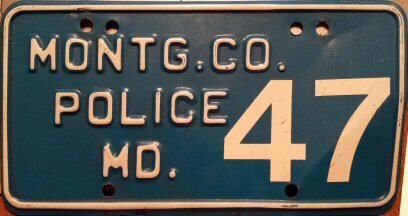 13 inch long government and emergency vehicle plates are rather uncommon, desite their civilian counterparts being made in that size from 1937 to 1955. Local law enforcement plates manufactured between about 1956 and 1963, used by the Baltimore County Police ("Whitey" photo / plate), Chevy Chase Village Police ("Ken" photo / plate), Frederick County Sheriff's Department, Greenbelt Police (Doernberg plate), Maryland - National Capital Park Police (Evans photo / plate), and Montgomery County Police (O'Connor photo / plate). 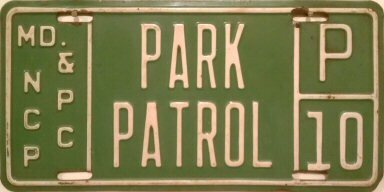 The Park Police plate is olive green in color. 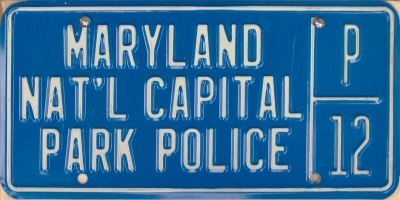 Local law enforcement plate manufactured between about 1964 and 1969, used by the Maryland - National Capital Park Police. 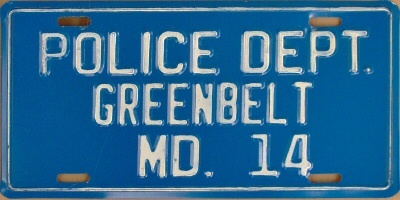 Notice the dark green color of the plate; non-park police plates of this era were blue. 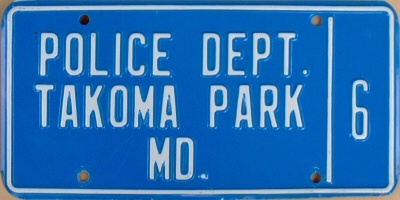 Local law enforcement plates manufactured between about 1970 and 1990 used by the Garrett County Sheriff's Department, Howard County Police (Doernberg plate), Maryland - National Capital Park Police (P/12: Doernberg plate), Montgomery County Police (Doernberg plate), Prince George's County Police (Doernberg plate), and Takoma Park Police (Doernberg plate). 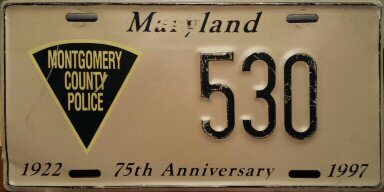 Local law enforecment motorcycle plates: Baltimore City Police plate manufactured between about 1956 and 1969; Montgomery County Police plate of unknown vintage, possibly manufactured between 1970 and 1990 ("Ken" photo / plate). 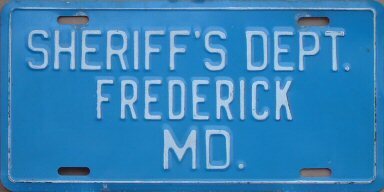 During this time, local police and sheriff's plates were invarialbly undated, painted white on blue, and identified the name of the law enforcement agency in embossed letters. (Well, there are the two park police plates shown above that are painted white on green). Usually these plates also had an embossed serial number which corresponded to the vehicle's unit number. The exact plate designs varied over time, and also from one law enforcement agency to another. Since these were undated plates, they were used for exetended periods of time. 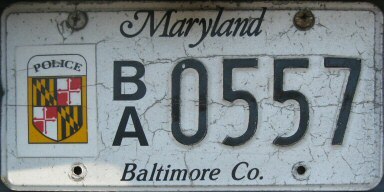 Similar to Maryland State Police plates, the best way to determine an approximate date of manufacture is to compare characteristics such as bolt slots or holes to those on regular, dated Maryland plates. 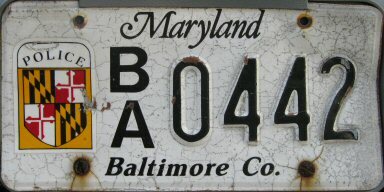 Long bolt slots – Regular Maryland plates with expiration dates between 1957 and 1964 had long bolt slots, so it's likely that local police plates with long bolt slots were manufactured between 1956 and 1963. However, these plates could have been used through the early 1990s. 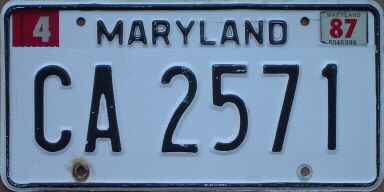 Short bolt slots – Regular Maryland plates with expiration dates between 1965 and 1970 had short bolt slots, so it's likely that local police plates with short bolt slots were manufactured between 1964 and 1969. However, these plates could have been used through the early 1990s. 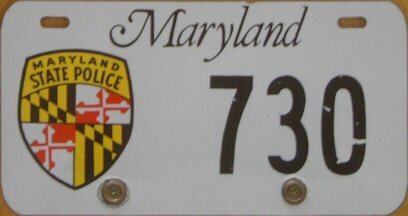 Round bolt holes – Regular Maryland plates with expiration dates beginning in 1971 had round bolt holes, so it's likely that local police plates with round bolt holes were manufactured and used between 1970 and the early 1990s. 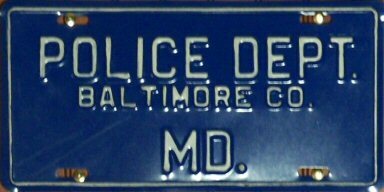 It should be noted that some local law enforcement agencies chose to run generic local government plates on even their marked patrol cars, rather than use specific law enforcement plates, particularly in the case of the city of Baltimore for many years. 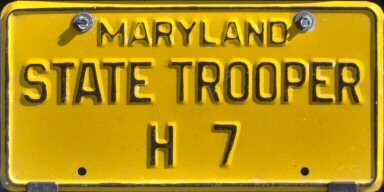 Also, Maryland Toll Facilities Police, a state police force, and probably other state government police units as well, used plates in the white on blue format usually reserved for local law enforcement plates. FYI, the Maryland - National Capital Park and Planning Commission (M-NCPPC) is a bi-county agency that, among other things, administers local parks in Montgomery and Prince George's Counties. 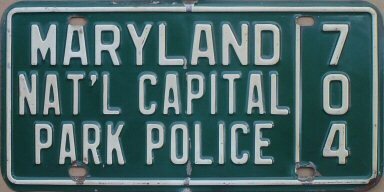 Park Police Officer and plate collector Bryson Evans reports that the law enforcement arm of the M-NCPPC has been known as the Maryland - National Capital Park Police from its inception in 1953, never as the "Park Patrol", despite the legend on the olive green late 1950s / early 1960s plate shown above. Local government police motorcycles used smaller versions of the plain white on blue plates. 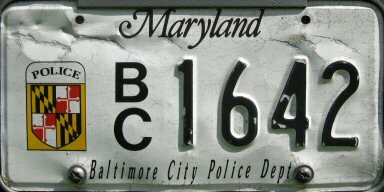 Two slightly different current Baltimore County Police plates (both Ellis photos); a current Baltimore City Police motorcycle plate (McDevitt photo); two current full-sized Baltimore City Police plates, one with a wordy but nearly illegible legend (Ellis photo), and the other, more common version; current law enforcement plates from the Montgomery County Police, Rockville Police, Laurel Police, Edmonston Police (Hartnett photo), Prince George's County Police, and the Garrett County Sheriff's Department (Sallmen photo). All plates shown were photographed in actual use. 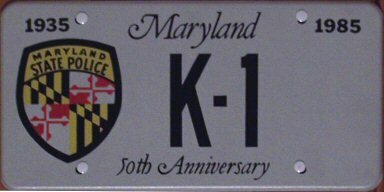 Since the early 1990s, local law enforcement plates have become more consistent and somewhat resemble Maryland organizational member plates. They have screened two-letter prefixes and embossed serial numbers on the standard reflective white background with the screened, script state name at the top. 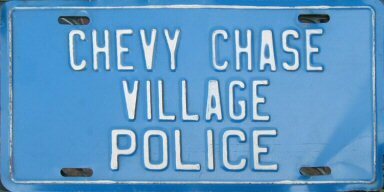 Regardless of the jurisdiction, police vehicle plates from various cities, towns, counties, local park departments, school districts, and community college and state university campuses have the same generic "Police" logo with a large state shield on a yellow background, placed on the left side of plate. Sheriff's department plates have an identical logo, but with the word "Sheriff" instead. In each case, the name of the jurisdiction or law enforcement agency is screened at the bottom of the plate. 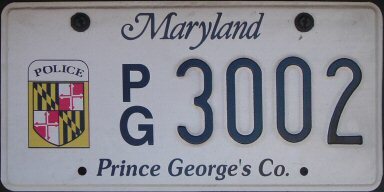 Plate serial numbers are in the format x/x 0000 and each number is unique statewide when combined with the prefix. Prefixes used on these plates are listed at the bottom of this page. However, a good number of local law enforcement units have elected to just run the standard "L/G" local government plates on their vehicles, rather than use these special police or sheriff plates. 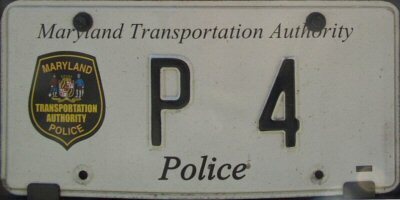 Local police motorycycles are issued similar plates, which also use two letter prefixes like the full sized plates. However, some examples have the agency name at the bottom, and some don't. 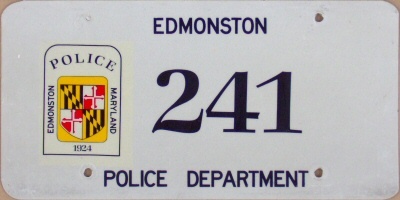 In the late 1980s, a number of local law enforcement agencies had non-standard graphic plates made. There did not seem to be any consistency between agencies, other than all of the plates I've seen were black on white and completely screened. I really didn't know whether these were just prototypes or were actually used on vehicles. I received a detailed e-mail from Richard Hartnett that was very helpful in clearing up how these plates came to be. 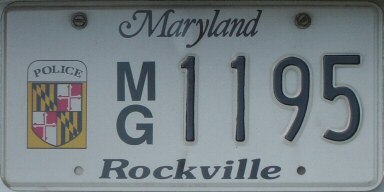 Richard reports that the Hyattsville Police Department was the first agency to have custom-made graphic plates (shown above) made by the license plate manfuacturing facility at the state prison in Jessup. A number of law enforcement agencies from various other jurisdictions followed Hyattsville's lead and obtained thier own custom graphic plates for their vehicles. The plate numbers matched the vehicle unit numbers, just like on the prior embossed blue-on-white plates. 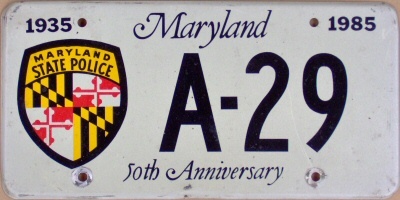 Richard futher explained that after a few years, the Maryland Motor Vehicle Administration "took notice of all the custom-made tags being displayed on police vehicles in Maryland, and decided to step in and put a stop to it." The result was the generic black-on-white law enforement plate design described and shown in the previous subsection. 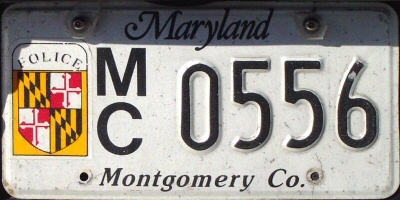 The above explanation fails to account for the 1997 Montgomery County Police plate shown above. I have to assume that the state allowed an exception to be made in this case. Based on the shapes of the bolt holes and the dies used to stamp the plate number, this plate was clearly not manufactured in the state license plate shop. Apparently, the state has backed off from its previous policy of not allowing alternate design law enforcement vehicle plates. 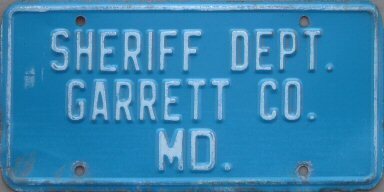 At least one law enforcement agency, the Cecil County Sheriff's Department, currently uses non-standard design plates with a non-standard numbering scheme. Plate spotter Reid Williamson photographed one of these; it appears to be a normal Maryland black-on-white plate, but it has a graphic design of a Cecil County Sheriff's badge on the left, with the word Sheriff immediately above, and the text Cecil Co. along the bottom of the plate. The plate number of the specific plate photographed was 99. No letters, no other numbers, just the number 99. In regards to the numbering sequence with law enforcement plates, it often varies by department. 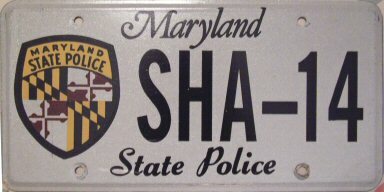 You are correct, that most Sheriff's Offices plates are prefixed with the letters SA, however agencies have the ability to create/design their law enforcement plates through Maryland Correctional Enterprises at no cost to the State of Maryland. Cecil County Maryland designed their own and has been utilizing their design for years. The plates in this section apply to local government fire and rescue departments, and volunteer fire companies and volunteer rescue squads. Ambulances owned by private businesses are class C vehicles and are issued regular plates, with embossed expiration dates or expiration stickers, depending on the year. These are addresed in the next section, below. 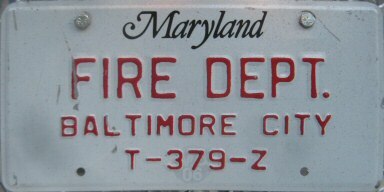 Maryland fire and rescue vehicle plates manufactured 1955 or earlier were similar to the white-on-red plates made and used from 1956 to about 1990. However, the plate dimensions differed from the current 12 inch by 6 inch size used since 1956. 15 inch long plates could date from the 1910s to at least 1936 and likely into the 1950s, and 13 inch long plates could have been made between 1937 to 1955, but probably only in the last few years of that period. 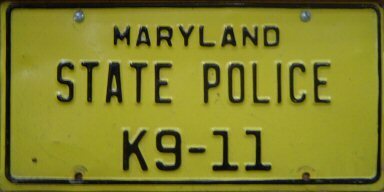 Based on their sheer quantity as well as bolt hole characteristics, I believe that Maryland continued to manufacture government and emergency vehicle plates on 15 inch long blanks long after 1936, which was the last year that regular, "civilian" plates were made that size. 13 inch long government and emergency vehicle plates are rather uncommon, desite their civilian counterparts being made in that size from 1937 to 1955. 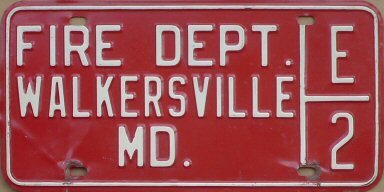 As other Maryland plate types had bottom bolt slots and small holes in the corners between 1931 and 1952, I'm going to say that both the Denton and Violetville Fire Department plates shown above are also from that timeframe. The Violetville plate number, F 84, doesn't conform to the format used since at least the 1950s. I don't know the meaning of the letter "F" or the significance of the number 84. 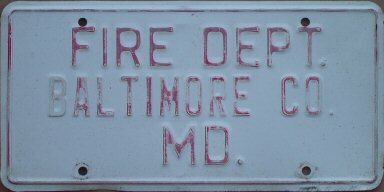 During this time, firefighting and EMS vehicle plates were invarialbly undated, and identified the name of the fire department or rescue squad in embossed letters. These plates were nearly always white on red, but occassionally were red on white. More often than not, any red-on-white plate would have been used on an ambulance owned by a fire department, or on a resuce squad vehicle. The exact plate designs varied over time, and also from one fire company or rescue squad to another. Most of these plates I've seen have an embossed serial number, usually with a single letter prefix. The letter prefix, if present, would identify the apparatus type: "A" for ambulance, "E" for pumper engine, "T" for ladder truck, etc. I haven't identified or deciphered all of the letter codes, but I take a stab at it at the bottom of this page. Single-digit numbers and low two-digit numbers could either identify the vehicle number within a fire station, or could be the station number within a given county. Otherwise, two- and three-digit numbers would consist of both the station number within a county, and the vehicle number within the fire station. 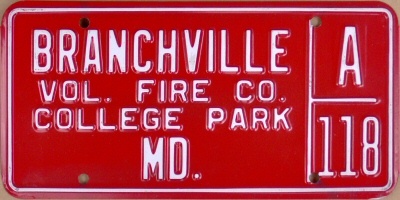 For example, the Branchville Volunteer Fire Company is fire station number 11 in Prince Georges's County. Unit number 8 in this station happened to be an ambulance, so this vehicle received plate A/118. This does not imply that they had eight ambulances; rather, they apparently either had at least eight total pieces of equipment of varying types, or they just designated an ambulance as "unit number 8". 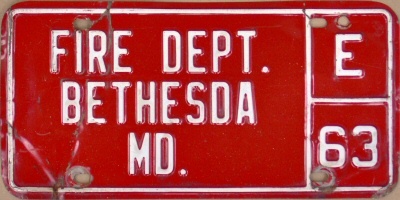 Likewise, one of the fire stations in Bethesda is Montgomery County fire station 6; unit 3 at this station was a pumper engine, so it received plate E/63. By contrast, the Mt. 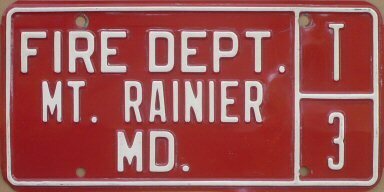 Rainier Fire Department is fire station number 3 in Prince George's County. Although they had other apparatus, they only had the one ladder truck, and saw no need to further identify it with a unit number. It's certainly possible that other plate numbering schemes were also used, however. Since these were undated plates, they were used for exetended periods of time. 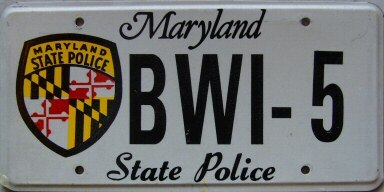 Similar to various law enforcement plates, the best way to determine an approximate date of manufacture is to compare characteristics such as bolt slots or holes to those on regular, dated Maryland plates. 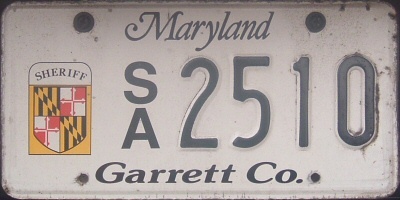 Long bolt slots – Regular Maryland plates with expiration dates between 1957 and 1964 had long bolt slots, so it's likely that fire/EMS plates with long bolt slots were manufactured between 1956 and 1963. However, these plates could have been used through the late 1980s. 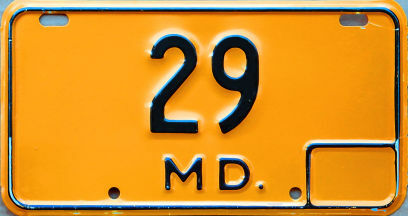 Short bolt slots – Regular Maryland plates with expiration dates between 1965 and 1970 had short bolt slots, so it's likely that local fire/EMS plates with short bolt slots were manufactured between 1964 and 1969. However, these plates could have been used through the late 1980s. 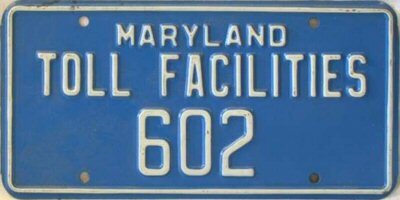 Round bolt holes – Regular Maryland plates with expiration dates beginning in 1971 had round bolt holes, so it's likely that local fire/EMS plates with round bolt holes were manufactured and used between 1970 and the late 1980s. It should be noted that at least one local rescue squad chose to run generic local government plates on their vehicles, rather than use specific rescue squad plates. 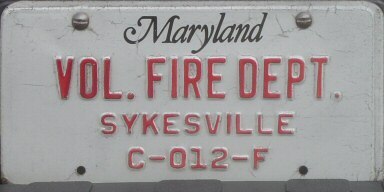 Current fire/EMS plates: two Sykesville Volunteer Fire Department plates (plates in actual use); two Howard County Fire Department plates, one with "Co." (O'Connor photo / plate), and the other with "County" (plate in actual use); two Laurel Volunteer Fire Company plates (plates in actual use); a Laurel Volunteer Rescue Squad plate(plate in actual use); three Prince George's County Fire Department plates with various dies (plates in actual use); two Baltimore City Fire Department plates (Ellis photos of plates in actual use), and a Baltimore City Fire Department / Box 414 Association plate (Mattes photo of plate in actual use). 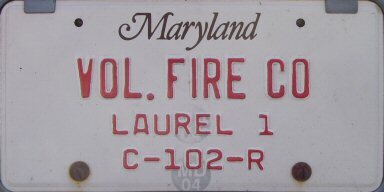 The graphic on Laurel Volunteer Fire Company plate number E-102-R is an unauthorized sticker that was applied to the plate some time after it was issued. The Box 414 Association is a non-profit organization that provides canteen and other support services to the Baltimore City Fire and Police Departments. 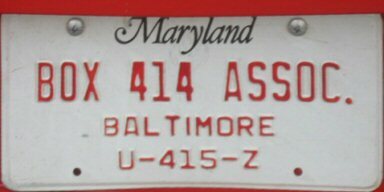 The Box 414 license plate shown above apparently indicates that the vehicle is dedicated for use by the association but actually owned by the Baltimore City Fire Department. 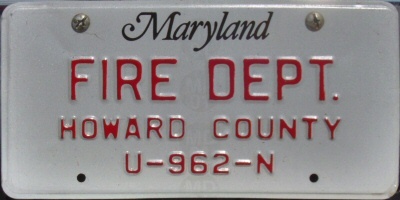 Since the late 1980s, firefighting and EMS vehicle plates have been made on standard Maryland plate blanks, but they are distinctive in that they contain no graphics, and all text on the plates is embossed with red characters, other than the familiar screened, script "Maryland" at the top. The text typically includes the name of the agency and a rather small plate number below it. The plates I've seen have formats x-000-x or x-0000-x. Plate numbers are not assigned sequentially, but rather each is a code identifying the vehicle and where it's based. The letter prefix and the numbers are typically assigned as was often done on the white on red plates. I don't have it completely figured out, but the prefix letter seems to indicate the class of apparatus (A = ambulance, E = pumper engine, T = ladder truck, etc. 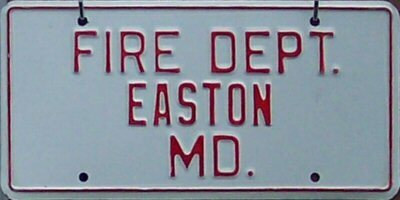 ), and in at least some cases where the plates name the specific fire station, the numeric portion of the serial is coded to identify the station number within a county, and usually also the individual vehicle within the station. 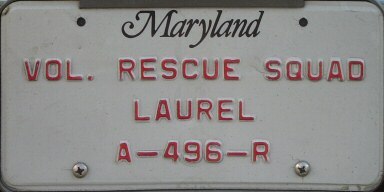 For example, the Laurel Volunteer Fire Company is Station 10 within Prince Georges' County, so the numeric portions of the serials start with "10". 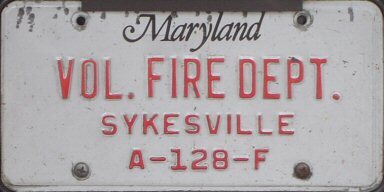 The Sykesville Volunteer Fire Department is Station 12 in Carroll County, so some plate numbers consist of "12" followed by a vehicle unit number, and others just have plate number "012". Vehicles not assigned to a specific station obviously do not use these formats; they seem to just use numbers that could not be used in the station-specific numbering scheme. The suffix letter specifies the county in which the vehicle is based. Maryland has 23 counties, plus the city of Baltimore which is not part of any county. The county suffix letters are assigned in alphabetical county name order, starting with: A = Allegany County. Letters I and O are skipped, so the last county alphabetically is: Y = Worcester County. Fire and rescue vehicles based in the city of Baltimore are identified with suffix letter Z. A complete list of prefix and suffix codes and their meanings may be found at the bottom of this page. The plates with the tall serial numbers seem to be older, while the plates with the shorter serial numbers are more recently issued. Your explanation of the apparatus numbering scheme is mostly correct, but it recently got more complicated when the [Prince George's County] and Montgomery County Fire Depts changed their numbering to conform with the system in use in [Washington,] DC and the Virginia counties adjoining DC. For instance, station 11 in Montgomery County used to have apparatus with a 3 digit number, the first two digits of which represented the station. As in, Engine 112, Ambulance 110, etc. 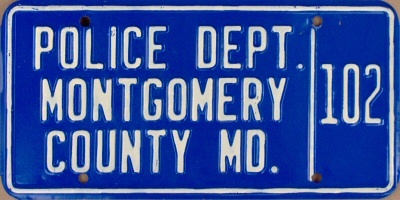 Under the new scheme, all apparatus in Montgomery County starts with a 7 in the hundreds digit, with the station number represented in the second and third digits. So the primary engine at station 11 in Montgomery County is now Engine 711, the secondary engine is Engine 711B, the primary ambulance at station 11 is Ambulance 711, the primary utility vehicle at station 11 is Utility 711, and so forth. All very interesting, John, but what I'm not clear about, and most interested in, is whether they changed the license plates to conform with the new apparatus numbering scheme. I haven't recently seen a firefighting vehicle from either Prince George's or Montgomery Counties to see. For some reason, most fire and rescue vehicles do not display front plates, but some do. Also, some fire and rescue vehicles display the generic "L/G" local government plates rather than agency-specific plates. The plates shown above may seem to be official fire department plates used on firefighting apparatus, but none of them are. All are organizational member plates issued to individual firefighters for their personal vehicles. 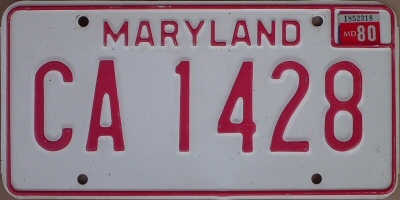 The red plate is a called a "strip", and in this case it's intended to be mounted below a regular license plate. 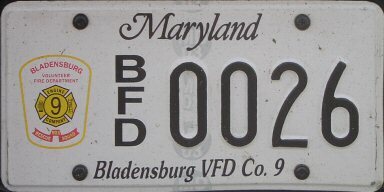 It's not an actual license plate, but rather a device used by a member of a fire company on his personal vehicle to identify himself as a firefighter. The "3" is not a serial number, but rather is the fire station number of that particular fire company. These were fairly common before the debut of the current organizational member license plates that now serve the same purpose. 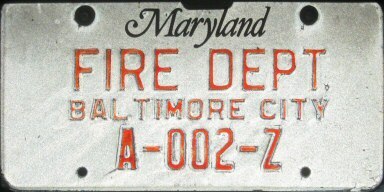 The next two plates, and others similar to them, are actual license plates that were issued from about 1972 to 1986 to members of the Maryland State Firemen's Association, which is a volunteer firefighters' organization. 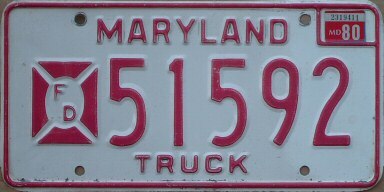 In the case of the red-on-white plate, it was issued to a firefighter's personal truck, not an actual fire truck. 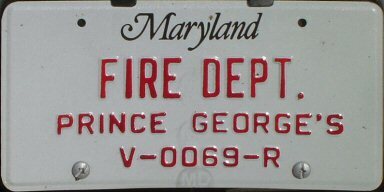 The next two plates, like numerous others similar to them, are organizational member license plates issued to members of the specific fire stations identified on the plates, for use on their personal vehicles. Suffice to say, graphic plates were not and are not used on actual firefighting equipment, but only on firefighters' personal cars and trucks. Likewise, for any black on white plates or plates with stickers. 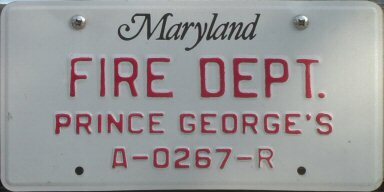 See more firefighters' and other types of organizational members' plates on my Maryland Organizational Member Plates 1920s-1987 and Maryland Organizational Member Plates 1986-Present pages. Ambulances owned by private ambulance businesses or medical facilities, as opposed to fire companies or rescue squads, are issued standard Maryland license plates. Private ambulances, as well as funeral vehicles such as hearses, are considered Class "C" vehicles and are issued the same type of plates. Therefore, a class "C" plate, off of a vehicle and without an accompanying registration card, cannot be specifically identified as having been issued to an ambulance. At least since 1954 expiration plates, class "C" plates have had a non-passenger serial format with the first or only serial letter always "C". (However, the first letter being "C" doesn't automatically mean that the plate is an ambulance/funeral plate.) Private ambulance plates are covered more thoroughly on the Maryland Commercial Passenger Vehicle Plates page. Headquarters (Pikesville), motorcycle, or ??? Unknown type. It's hotly debated by plate and MSP historians whether "TR" stands for training vehicle, truck, or trailer. Rescue truck – heavy rescue equipment truck with jaws of life, etc. Thanks to those who have directly contributed to the information on this page: Jeff Ellis, David Doernberg, Mike Sells, Tim O'Connor, "Tiger" Joe Sallmen, John McDevitt, Justin Mattes, "Whitey", Paul Casadonte, Bill Ceravola, Richard Hartnett, John Witherspoon, Tom Castelli, Norm Ratcliffe, Bryson Evans, Jon Olivarri, and "Ken". O'Connor photographs © copyright by Tim O'Connor. All rights reserved. Used with permission. Doernberg, Sells, Sallmen, McDevitt, Mattes, "Whitey", Casadonte, Ceravola, Ellis, Hartnett, Evans, and "Ken" photographs are presumed to be copyrighted by David Doernberg, Mike Sells, "Tiger" Joe Sallmen, John McDevitt, Justin Mattes, "Whitey", Paul Casadonte, Bill Ceravola, Jeff Ellis, Richard Hartnett, Bryson Evans, and "Ken", respectively, and are used with permission. Doernberg, Harbold, and Olivarri plates are from the collections of David Doernberg, Harold Harbold, and Jon Olivarri, respectively. All text and photographs © copyright 2005-2014, 2017, 2018 by Rick Kretschmer, except where noted. All rights reserved.